This set of nesting dolls has been created in the ancient Russian town of Sergiev Posad by the talented master Listunov Oleg. 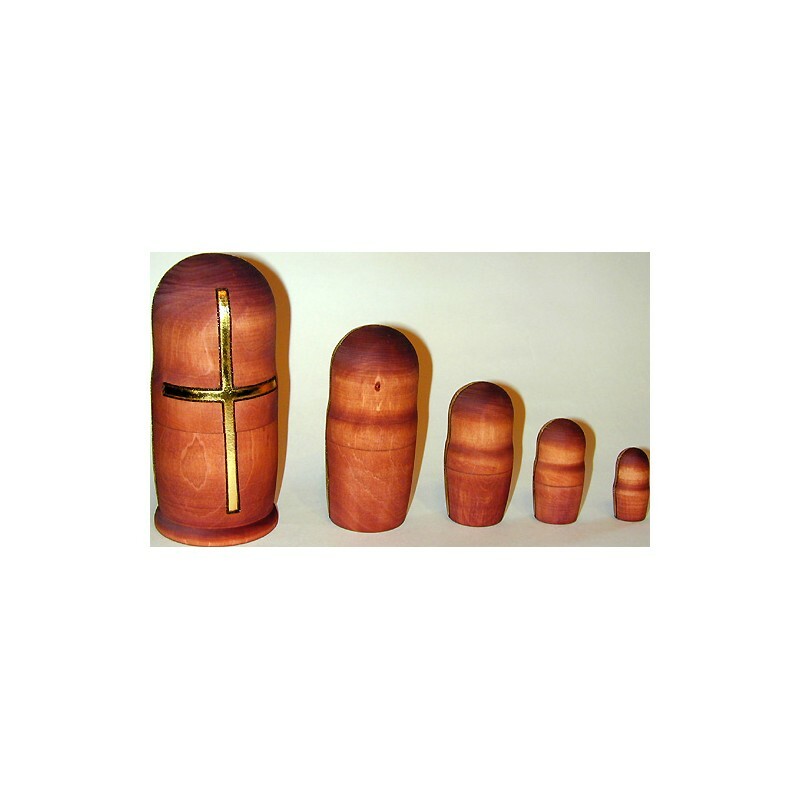 The work is based on the religious theme, and includes five wooden dolls. 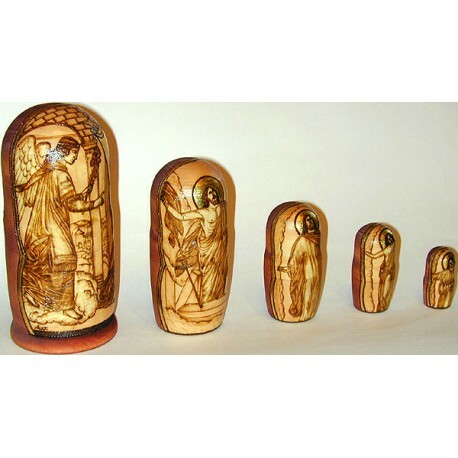 The first and the biggest doll features the miracle of Annunciation. This biblical event is centered on the persona of Mary. She is a young maiden from Nazareth, who receives the announcement from the Archangel Gabriel that she will give birth to God's Son, our Lord Jesus Christ, in the flesh because she has found favor with God. The term "annunciation" means the "announcement" of glad tidings from God to members of the human race. 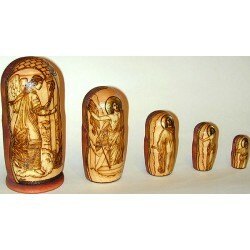 Each of the rest four dolls feature only the figure of Jesus Christ. To produce this work Listunov has applied the unique technique of poker-work. It has been done so skillfully that it is hard to believe that the texture of hair, face complexion, the landscape and different materials are not painted but burnt out with the help of a special device. The backside of each doll is covered with light brown paints that tone perfectly with the color of burnt wood. The brilliance of halos above the heads of Jesus Christ and the Blessed Virgin is created with the help of gold metal leaf. 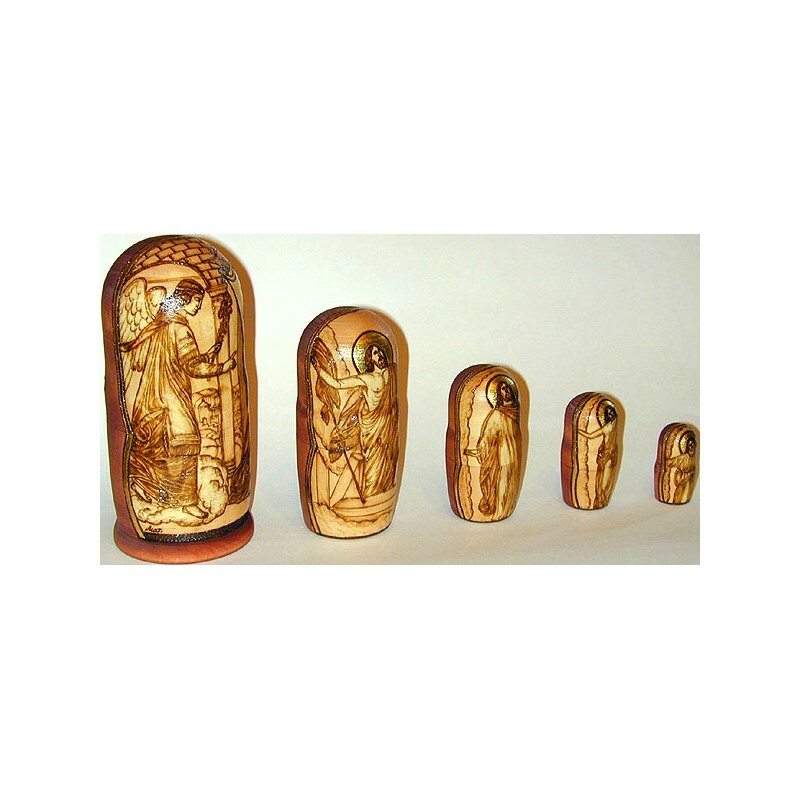 Gold metal leaf is also used to create the holy light falling on the Blessed Virgin and the gold cross that can be found on the backside of the first and the biggest doll. A thing band of gold metal leaf also frames each scene displayed on each doll.